Taiwanese President Ma Ying-jeou said Sunday he accepts responsibility for the government’s slow response after Typhoon Morakot slammed into the island killing at more than 120 people and unleashing floods, mudslides and misery. Morakot hit the island last weekend, dropping 2.6 meters (102 inches) of rain. Before it roared on to mainland China on Sunday, the storm killed at least 123 people in Taiwan. The death toll could climb to more than 300 after more villagers buried by mudslides and floodwaters are found, Taiwan officials have said. Southern and central Taiwan were hardest hit by the storm. 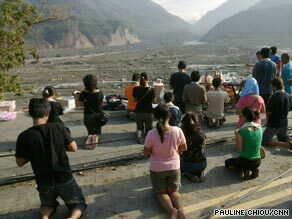 Mudslides inundated some places in the south, including the village of Shiao Lin, where 160 homes were lost. Authorities believe hundreds of people could be trapped under five stories of mud in the village. International aid efforts were mobilizing on Sunday, however these were complicated by diplomatic pitfalls in the face of China’s territorial claims over Taiwan, which it considers a renegade province. The United States said Saturday it would send food, portable shelters and other aid items to Taiwan in the coming days. In aiding Taiwan, the United States must be sensitive to its territorial relationship with China, the sources said.